Come dance the night away to the tunes of The Vine Shakers. 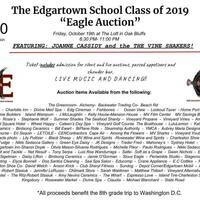 And in between dances, support the Edgartown 8th Grade's trip to Washington, D.C., by bidding on lots of stuff at our silent and live auction. Silent auction starts at 6:30 p.m. Live auction around 8:30 p.m. Dancing throughout the night. Even some munchies included.